Becky Benishek studied English and Environmental Science at Lawrence University in Wisconsin, and always hoped to turn her lifelong loves of writing and animals into something wonderful. Becky writes children's books, adult fiction, and poetry, and occasionally tries her hand at songwriting. One day she intends to go through all the napkins, envelopes, and notebooks full of ideas, starts, middles, and finishes into actual books. Becky manages several online communities and helps connect people with the resources they need to help individuals with special needs. She lives with her husband, Dave, and assorted guinea pigs. Dr. 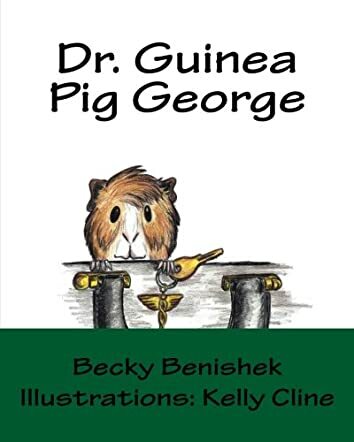 Guinea Pig George is a children’s book, written by Becky Benishek and illustrated by Kelly Cline. George is a Guinea Pig who lives with a human family. At the head of the family’s household is a doctor, also named George. As patients call Dr. George’s home, his pet Guinea Pig mistakenly assumes that the call is for him. While the doctor prepares for patient visits, his Guinea Pig cleans his own cage, before climbing down to the floor and sneaking into the doctor’s medical bag, which is taken on house visits. Over time, Guinea Pig George learns human mannerisms and medical terminology. One day, when he accidentally falls out of Dr. George’s bag during a house call, the frightened Guinea Pig scurries to the nearest house and calls out, only to be recognized by the occupant as Dr. George’s Guinea Pig. By the time the doctor arrives, he is greeted by the sight of his Guinea Pig, George, who’d just patched up his first young patient. I would have to say that this is one of the most unique, joyful books I have read in a very long time. Becky Benishek’s story of a guinea pig who pays careful attention to his humans is a great book for kids to read, and would also be enjoyable to grown-up guinea pig owners as well! With most of the story’s focus being on the behavior of the family guinea pig, readers quickly learn how George interacts with his human family, while carefully absorbing as much observed detail as possible. In doing so, he knows exactly what to do and where to go when Dr. George accidentally drops his bag in a patient’s driveway, leading him to not only misplace some of his medical supplies, but also causing him to inadvertently lose his guinea pig too! From start to finish, Dr. Guinea Pig George fills his readers with delight. I recommend Dr. Guinea Pig George to all readers, young and old, who are not only mesmerized by the human-like traits of animals, but also who adore their guinea pigs!